Creating consensus among white nationalists, neo-Nazis, Ku Klux Klansmen and the like is akin to herding rattlesnakes, given the caustic personalities often involved. Members typically get mad at each other and split, sometimes within days, resulting in the near-constant creation of new groups and a churning of both leaders and followers. That’s why it’s something of a surprise that an alliance of white-power groups born in a KKK bar in Georgia is marking its first birthday. Composed of multiple extremist groups, the Nationalist Front had its anniversary Saturday. Similarly, six Klan organizations from around the country announced a consolidation last month. The common goal, as these alliances see it, is protecting the white race at a time when the Census Bureau projects whites will be a minority within three decades. Some robe-wearing KKK members who were initially part of the Nationalist Front dropped out, and some Klan groups are now consolidating to build membership and power. The American Alliance of Klans formed during a meeting in rural Florida in March. More Klan groups have joined since, leaders say. I suppose it is not a surprise to find a Delaware connection to the KKK and this supremacist business. Better that they are where we can watch them, but sheesh. Still, Mr. Larson provides an interesting confirmation of the MAGA game, right? 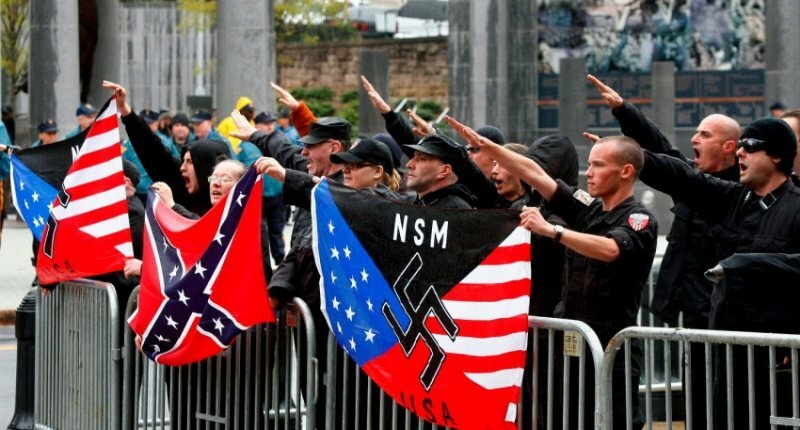 While everyone is busily deconstructing the fairly ineffective last 100 days, let’s not forget that these supremacist groups have some renewed energy because this administration’s campaign and governing messages.